Building a resume is important. But sometimes, the most important thing is simply to have time being a boy. 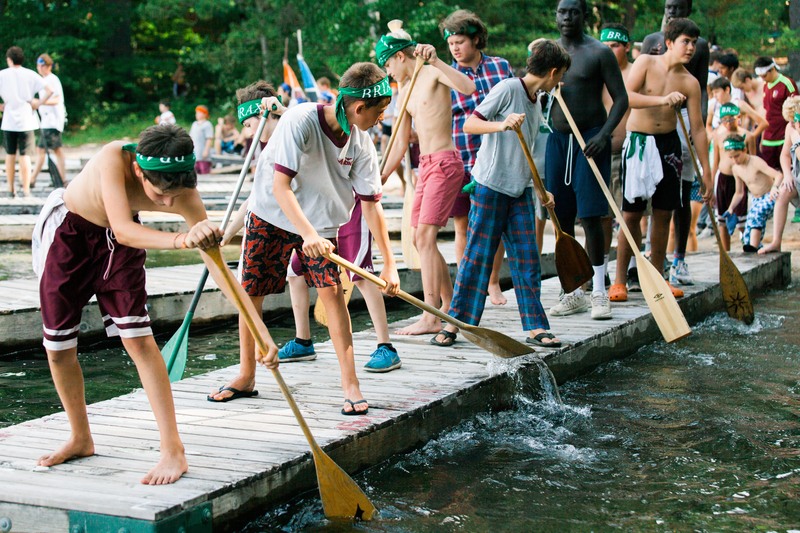 Welcome back from the Winona Camps Blog! Campers celebrate after the BATs are revealed on Awards Night. Where has the time gone? It feels like just yesterday counselors were standing at the entrance to each of the units eagerly anticipating the arrival of all the campers for Winona’s 109th season. After some time off for the summer, The Winona Camps Blog is back for another year of updates, information, and fun reads about the place many of us call home – Winona! Before we move on and look forward to our 110th season, we thought it would be fun to look back on one of the more memorable moments from the past summer . 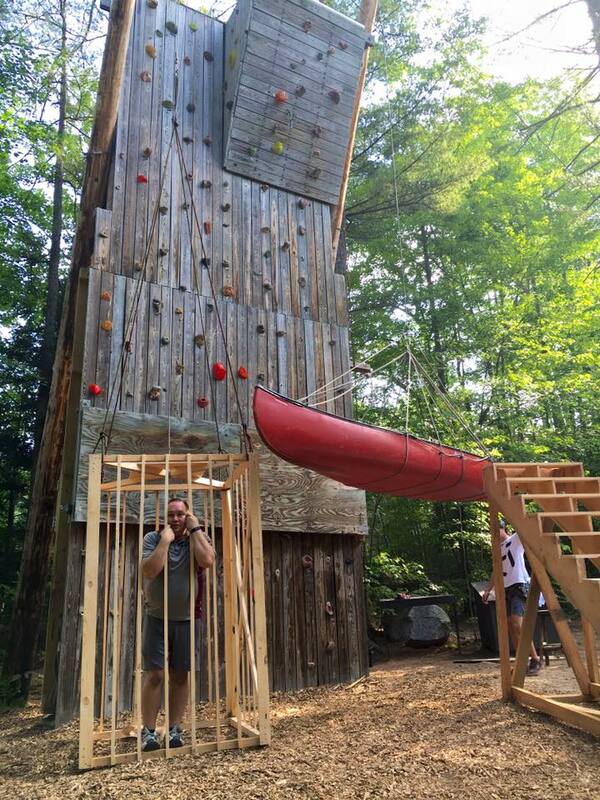 . .
Uncle Spencer was forced into this cage by Old Man Sturdley, but campers worked to fill the hanging canoe with water from the lake to raise the cage and free Uncle Spencer! Winona’s 109th season was one of memories, new events, and friendships that will last a lifetime. This past summer was full of big events, but perhaps none larger than the adapting of an old tradition into the creation of the “Sunrise Showcase”. The Sunrise Showcase began right as all the campers went to sleep – the counselors got to work once it was dark and began transforming the entire camp into a whole new world. As 7:30 AM came around, the campers were awoken and all together we made our way to a location just above the Dining Hall where they were introduced to “Old Man Sturdley” who was trying to overtake camp. Now that the storyline was set-up, and after a brief break for breakfast, campers from all the units worked together to compete in a mix of games such as kingpin dodgeball, obstacle courses, sock pulls, and many others. As each game was completed, the campers with the “power of Winona” continued to grow stronger which ultimately helped Uncle Spencer and Aunt Laura to take back Winona and return justice the shores of Moose Pond! At the end of the morning, a bridge was created out of all of the docks in Intermediate that reached out to Treasure Island where a key was used to lock out all danger. The campers loved seeing all their counselors dressed up as characters from movies, pop culture figures, cartoon characters, and sports players and enjoyed playing their part in defeating those who were trying to take Winona away. The campers competed within their tribes, but the focus was more on the whole camp coming together as One Camp to achieve a common goal. This was an event unlike any other, and hopefully the work done by the campers that morning will keep any (fictional character) danger away for years to come… but who knows what will happen next? This past summer was one full of many changes, traditions, and memories – there is no possible way in which to fully explain each and every one. We hope you enjoyed hearing a bit about our past summer and a few of the things that helped to make it truly special. The memories made, friendships built, and life lessons learned will be with all of us for our whole lifetime and we here at Winona are already excited for another summer full of them. We would love to hear from you as well! Email some of your favorite memories to information@winonacamps.com and we may share some of them in our next post – check back soon! Senior Winona friends – all smiles! Welcome to the new blog for Winona Camps! This page is going to bring you a variety of fun information on Winona; from meet the counselor, to meet the camper, to various updates on camp as the seasons change. It’s hard to ever have too much of Winona, and we hope to bring you your fill of Winona year round. We encourage you to check back periodically to see the many types of updates posted here. Camp is just around the corner; just as we are, we are sure you are counting down the days left until camp opens on June 29th! Keep warm!